Philadelphia 76ers center Joel Embiid gestures to the crowd during the first half of Game 3 in Miami. 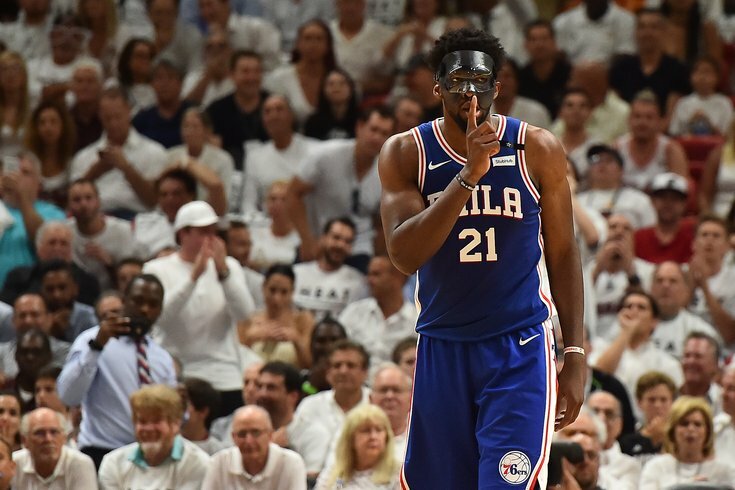 To say that the Sixers surpassed the expectations laid out before them by the media and their fans prior to the start of the 2017-18 season, well, that would be one hell of an understatement. Sure, watching them fall to the Celtics in five games, as favorites, in the Eastern Conference semifinals, had to sting for fans who allowed the rapidly raising expectations to temporarily blind them from reality. But a brief trip down Memory Lane can serve as a reminder of where those expectations began – and how the Sixers' current reality isn't actually a bad consolation prize, especially when you consider where this team sat just a year ago. The Sixers finished with a 52-30 record, nearly matching their 56 wins from the previous three seasons combined, which was good enough for the third seed in the East, one spot ahead of LeBron James and the reigning conference champs, and 10.5 games better than the season win total being offered by most sports books back in October (41.5). Joel Embiid, limited to 31 games over his first three seasons with the team, appeared in 63 of the Sixers' first 74 games this season before a freak injury caused the 24-year-old center to miss the last few weeks of the regular season with a fractured orbital and a concussion. He also made his first NBA All-Star team. Meanwhile, Ben Simmons posted a historic rookie season that could should earn him Rookie of the Year Honors. Brett Brown, who may have been out-coached by Brad Stevens in the playoffs, certainly showed improvement year-over-year, as did several of his young players (see: Saric, Dario). Unfortunately, we saw little to no improvement in the area of preseason prognostications among members of the local and national media, which we catalogued back in the fall. Most fell way short of the Sixers' 52 regular season wins. But not all of them. One member of the Philly media actually thought the Sixers would be better than they were, but was still so close it's scary. That is, right up until you realize it's Howard Eskin – and that his prediction was almost totally sarcastic. That's right, the one guy who almost nailed his prediction was just a Process-hating troll who was actually mocking overly optimistic Sixers fans. Now that they're season is officially over, we thought it'd be a fun – and somewhat cathartic – exercise to take one last look back (way back) and see just how some actual predictions held up, starting with this one from Joe DeCamara over at WIP. The competition in the East got significantly weaker this offseason with the departures of Carmelo Anthony, Jimmy Butler, Paul George and Paul Millsap to the West. The Bulls, Pacers and, following the trade of Dwight Howard, the Hawks have seemingly dropped from playoff contention. That leaves room for three new teams to move up into the top eight. ... and former on-air host Marshall Harris. • Zach Lowe of ESPN was pretty close, especially with the number of games Embiid needed to play. He also correctly predicted the Sixers would trade Okafor, he just didn't have the destination right. • The Bleacher Report Staff picked the Sixers to sneak into the playoffs. Yes, young teams typically don't win a lot of games. Yes, we're dealing with major injury concerns for Joel Embiid and—to a lesser extent—Ben Simmons, who missed all of what would've been his rookie season with a foot fracture last year. Yes, turnovers are going to be a problem for Markelle Fultz and the other youngsters. • Sean Deveney of Sporting News had the Sixers making the playoffs as the seventh seed. • Alex Wong of Sports On Earth believed the Sixers would miss out on the postseason. • Ben Golliver of Sports Illustrated had the Sixers finishing ninth, one spot behind the Pistons. • USA TODAY had the Sixers finishing 38-44, which was tied with the Hornets for the eighth spot in the Eastern Conference. • Over at ProBasketballTalk, two out of three picked the Sixers to make the playoffs as the No. 8 seed, but neither seemed extremely confident in that choice. So, sure, the Sixers' somewhat sudden exit from the postseason may not have been the lasting impression fans wanted to take with them into the summer. But, if you can take the long view of this team, it becomes obvious that this season was an expectations-shattering success.